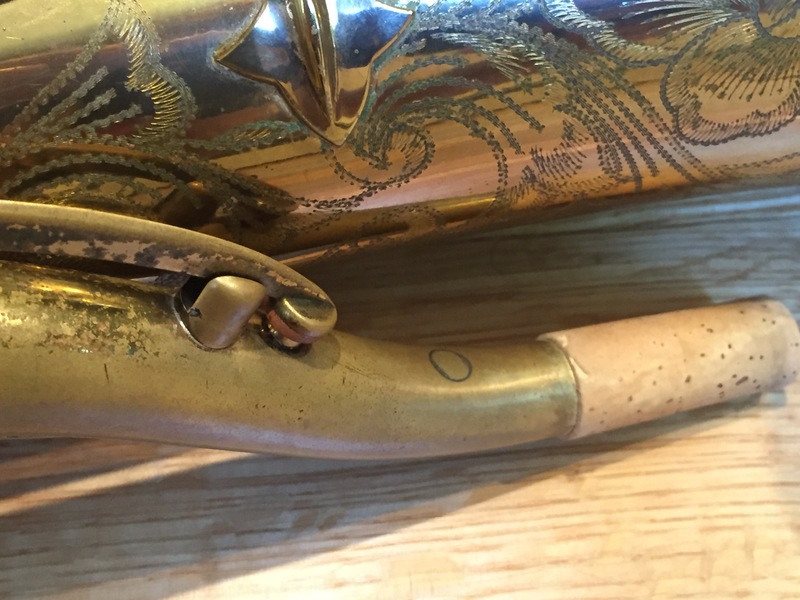 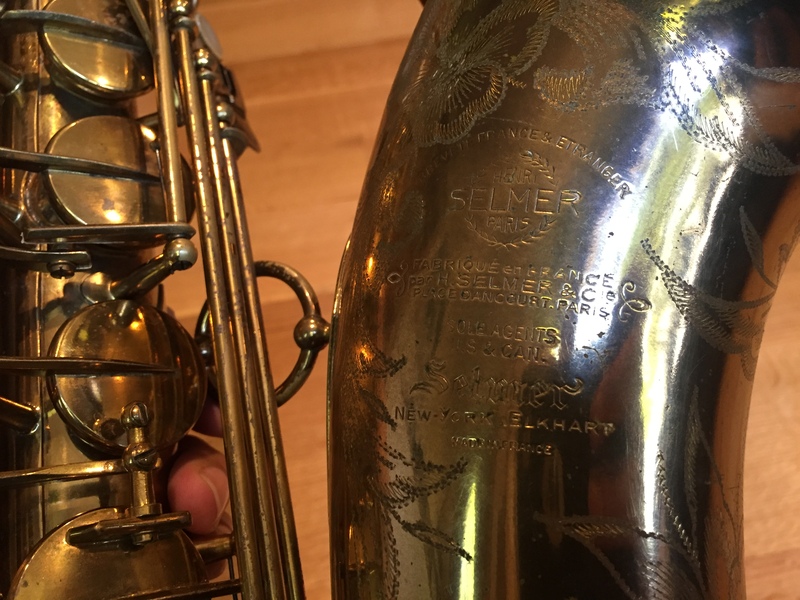 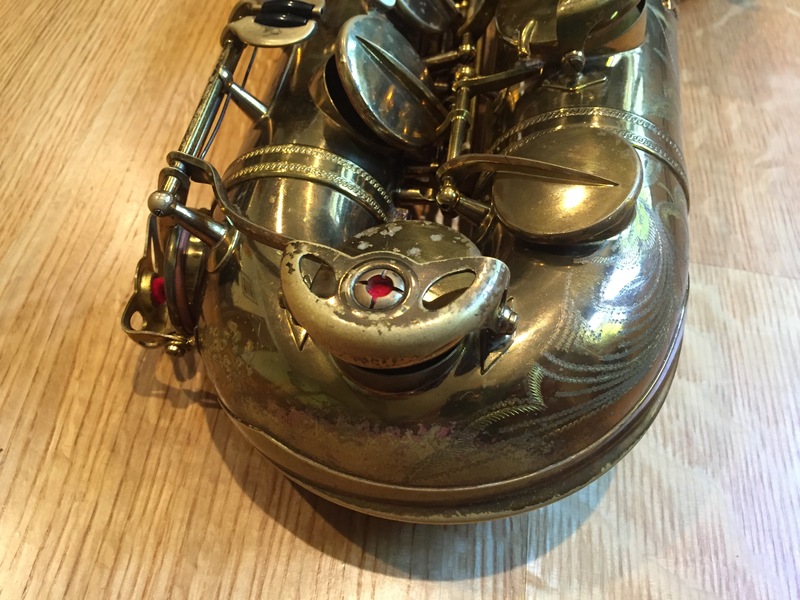 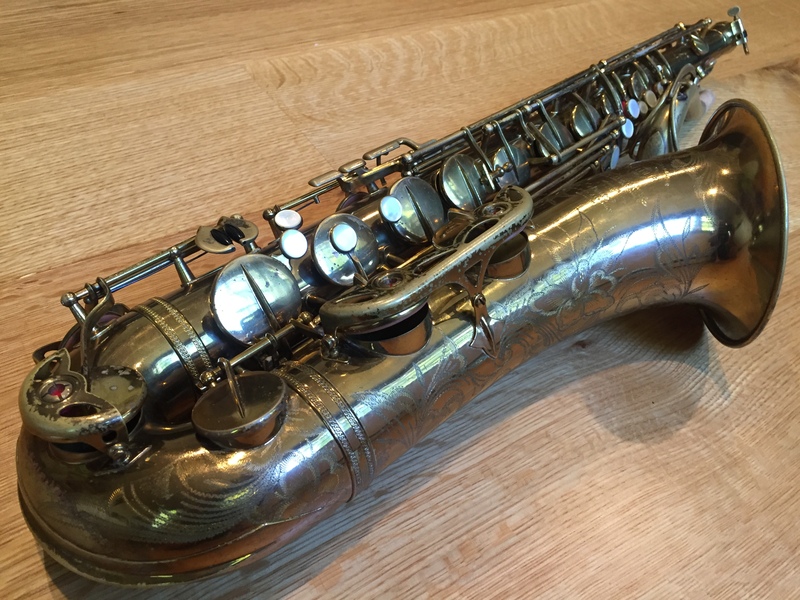 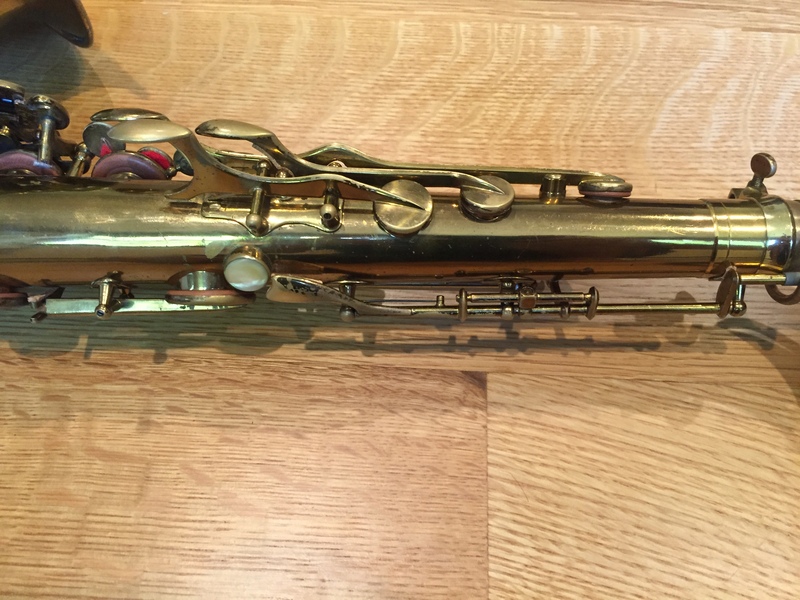 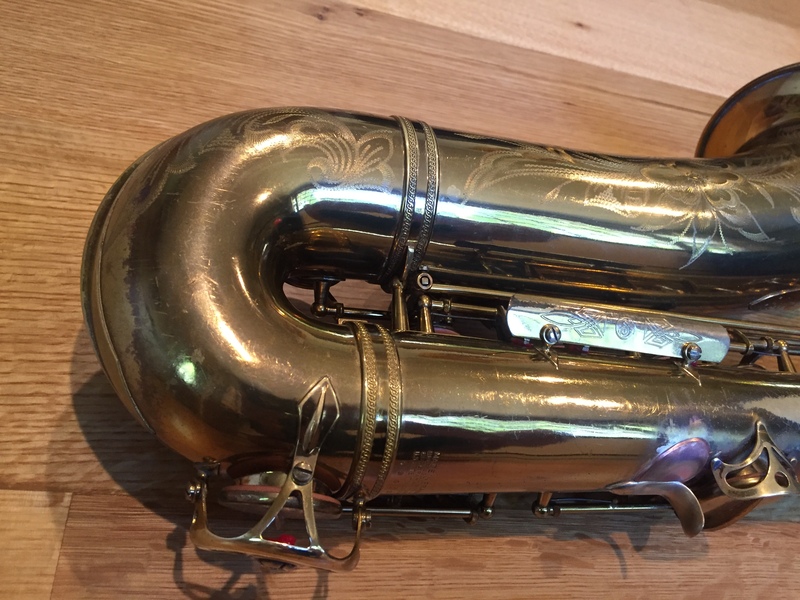 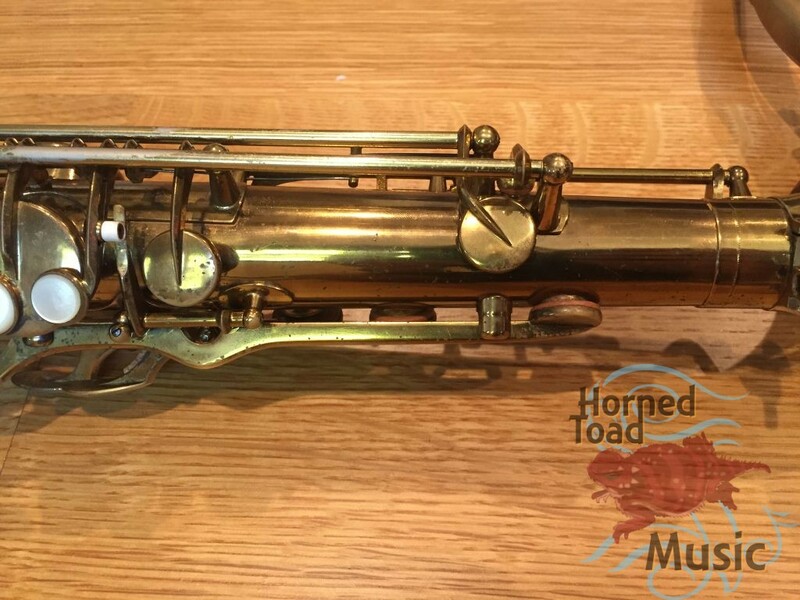 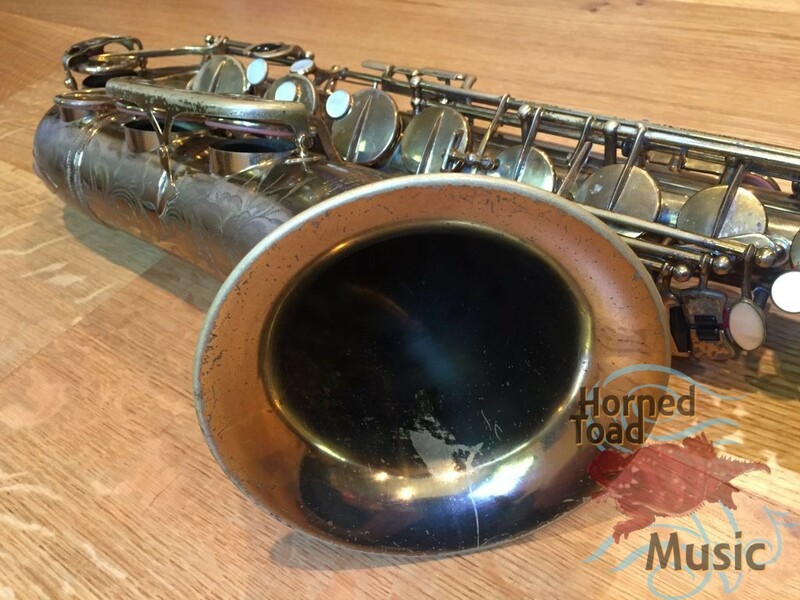 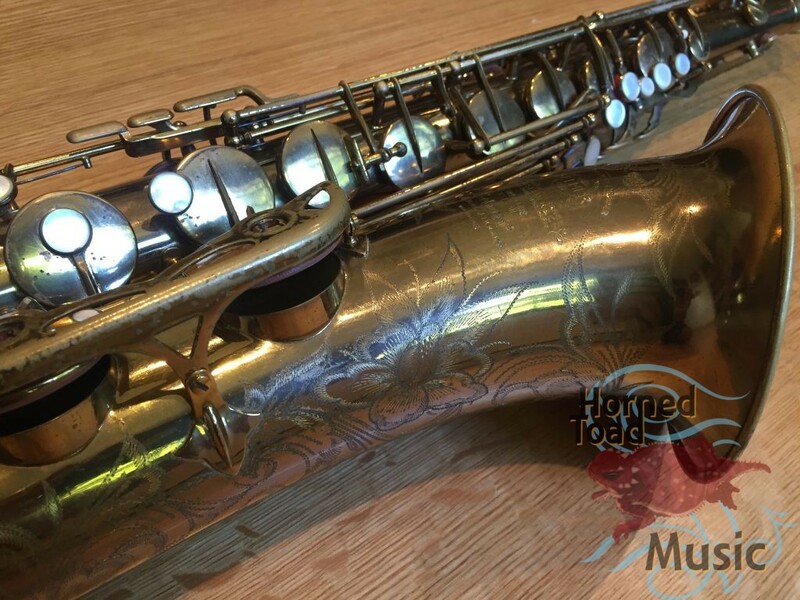 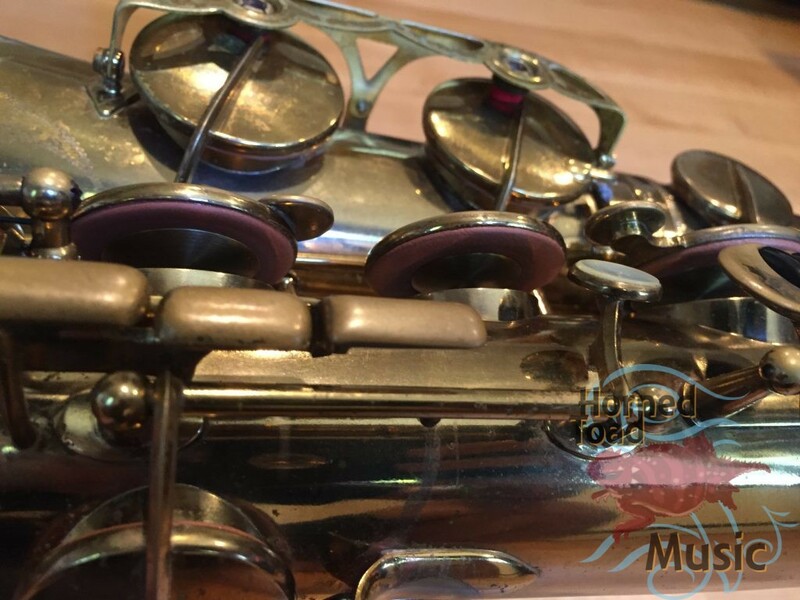 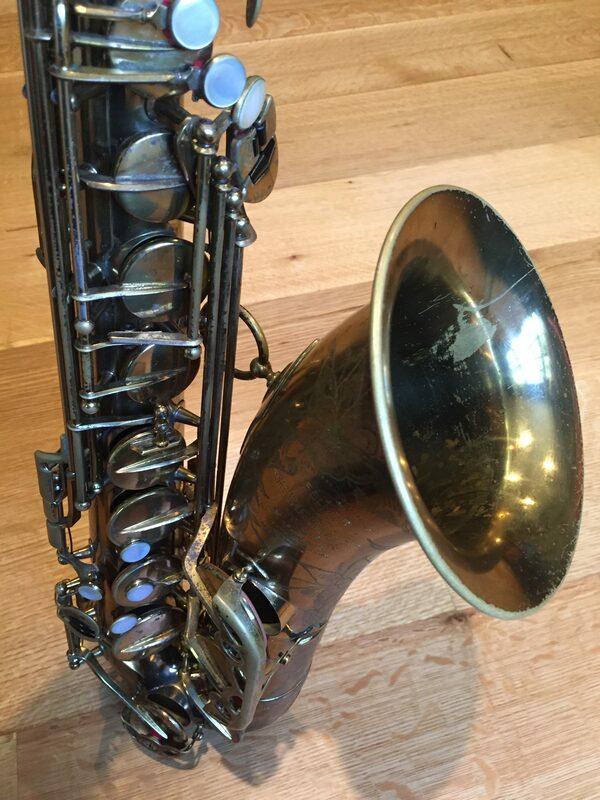 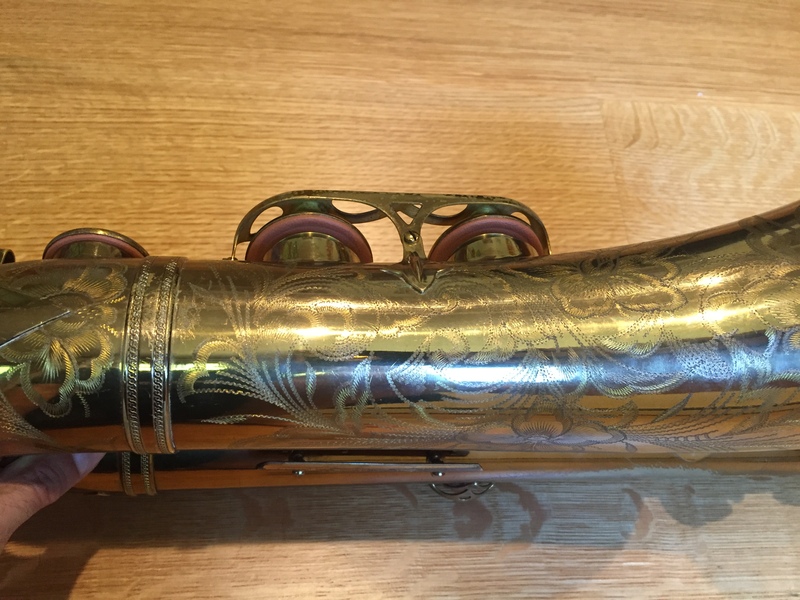 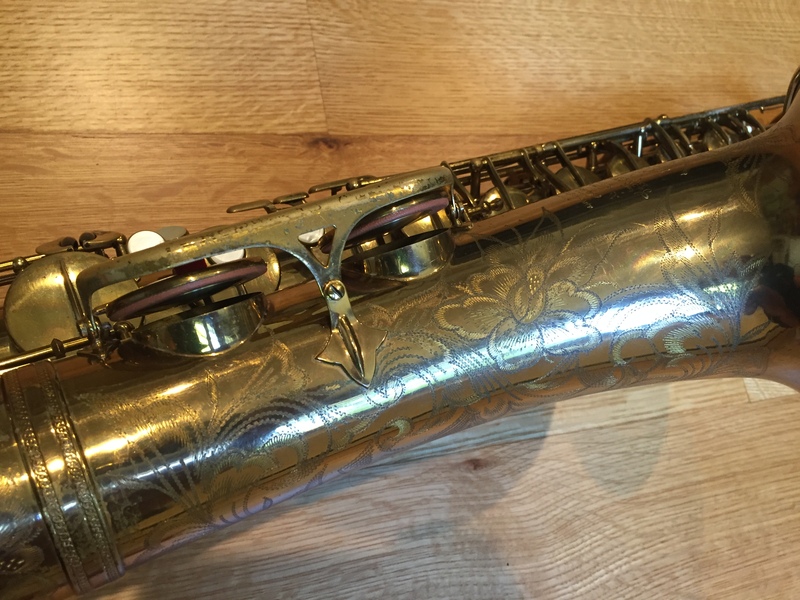 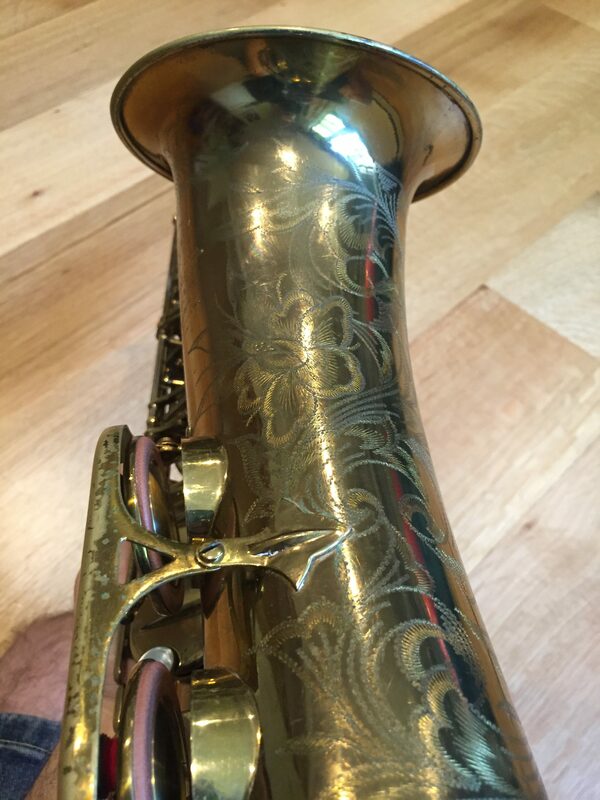 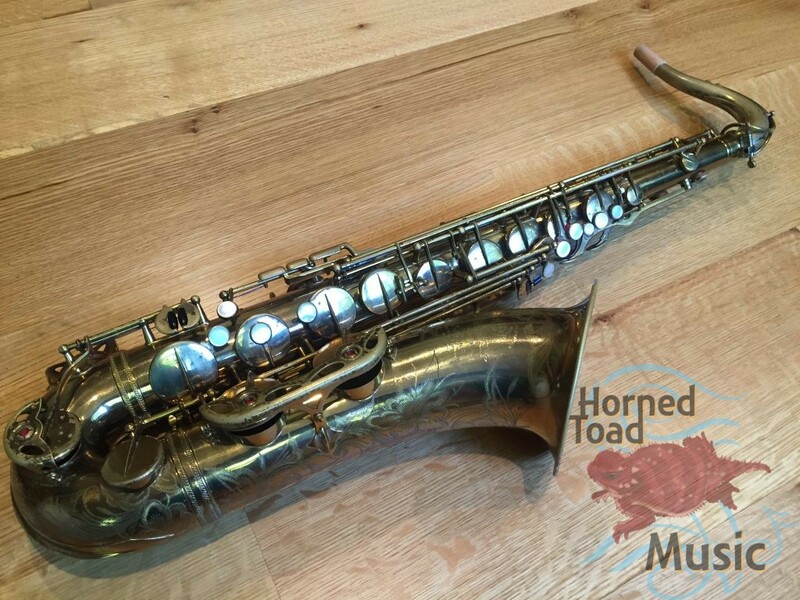 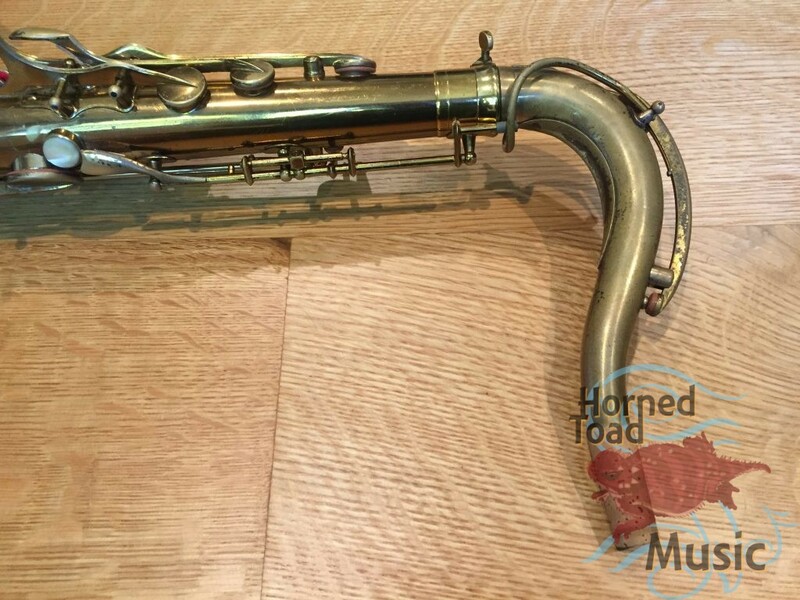 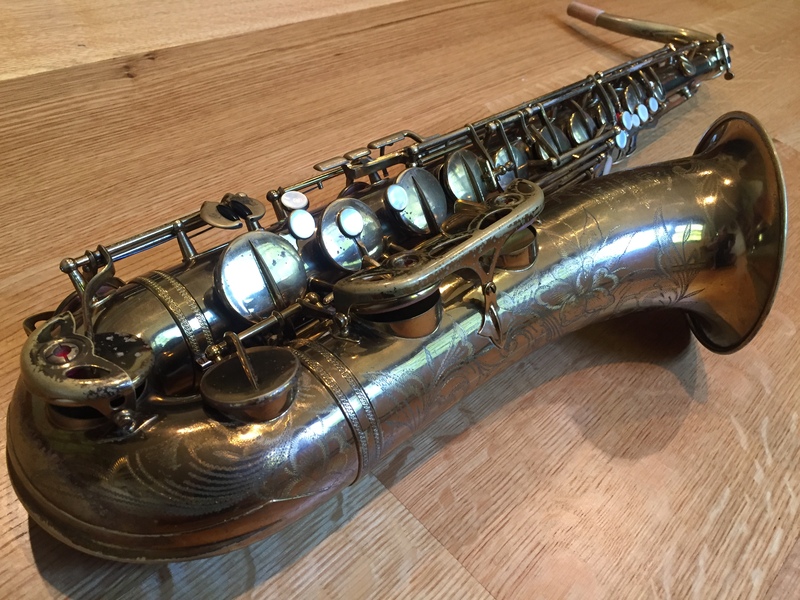 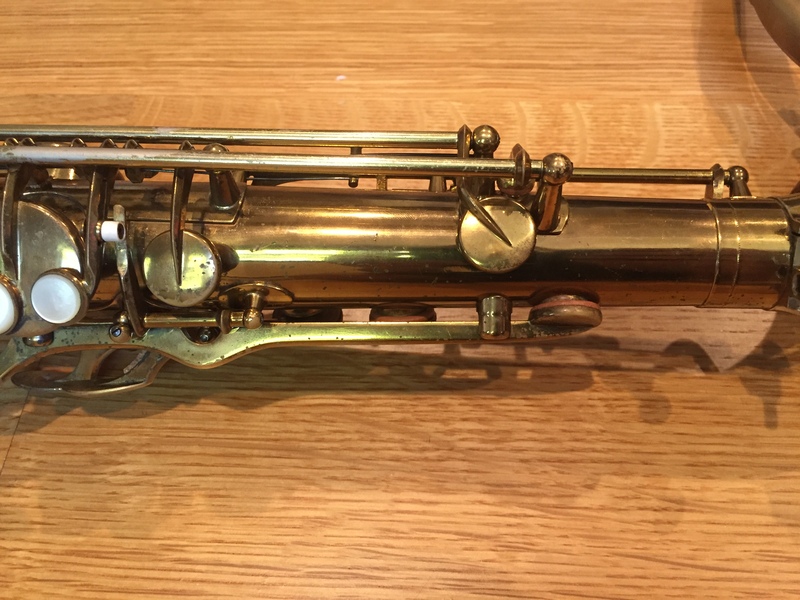 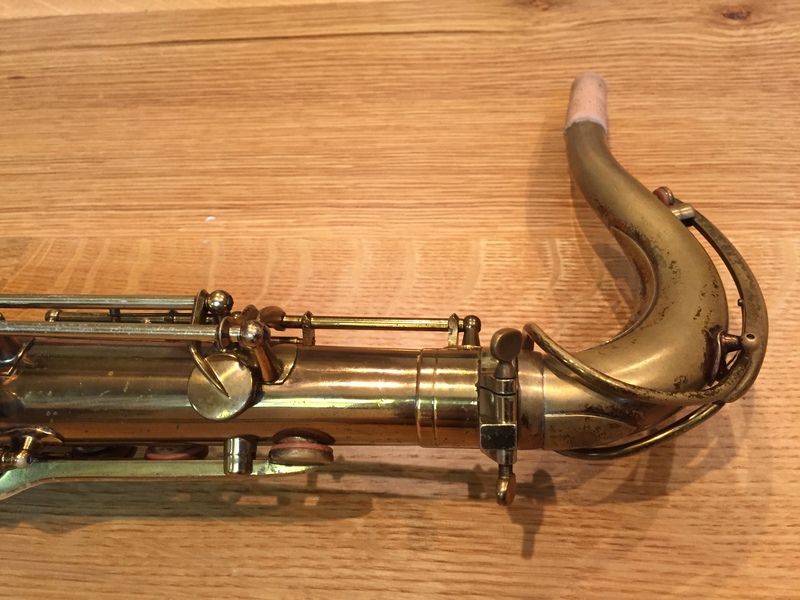 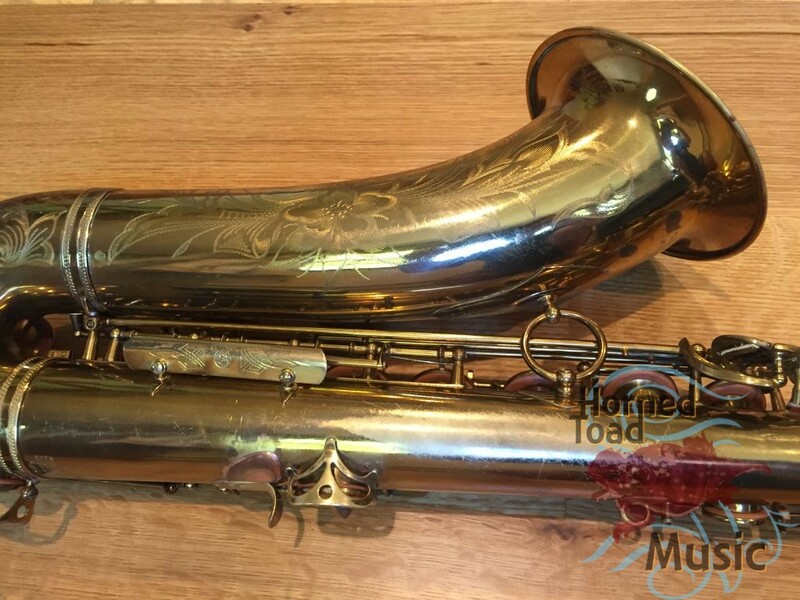 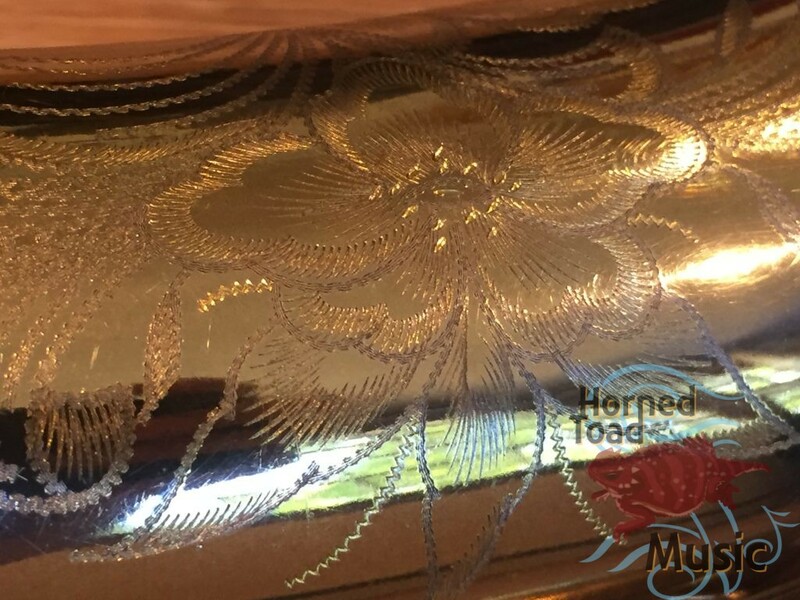 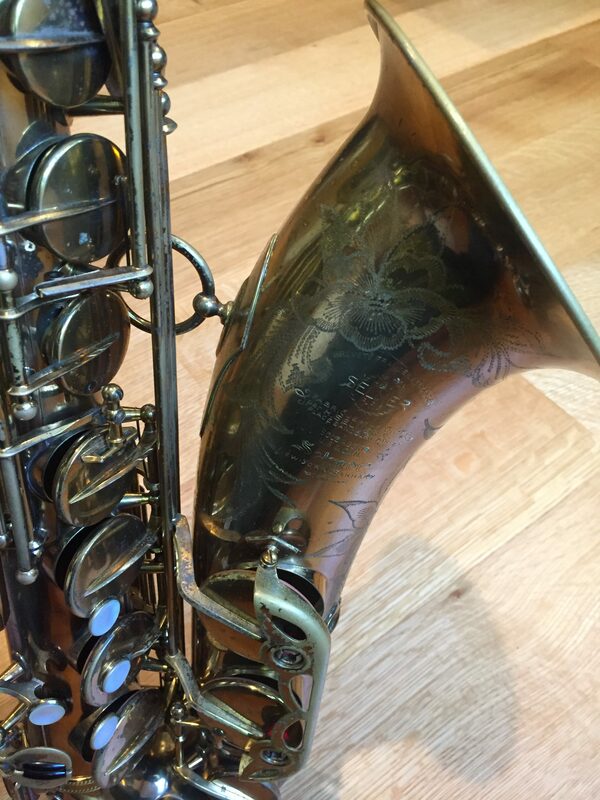 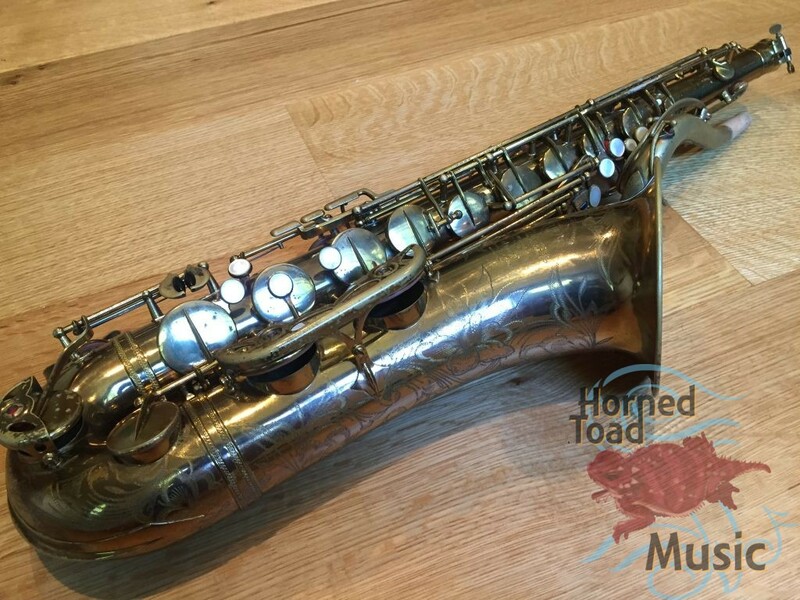 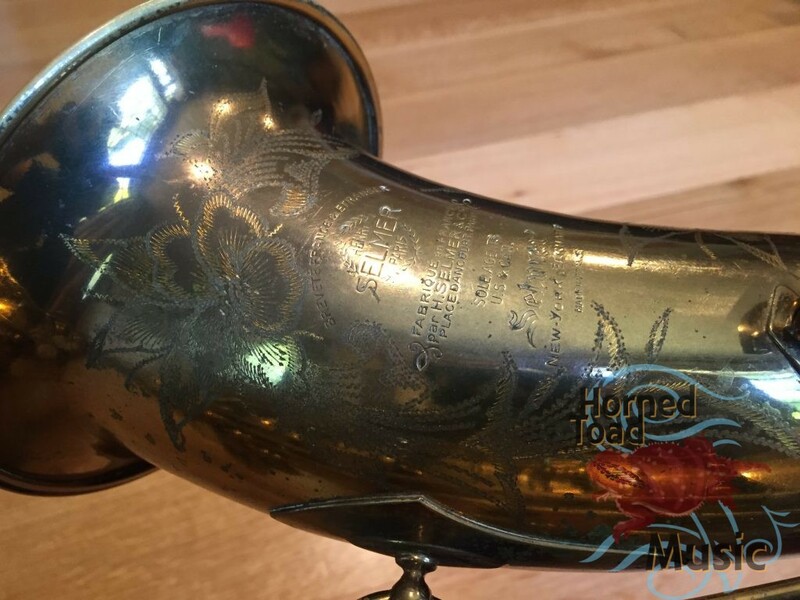 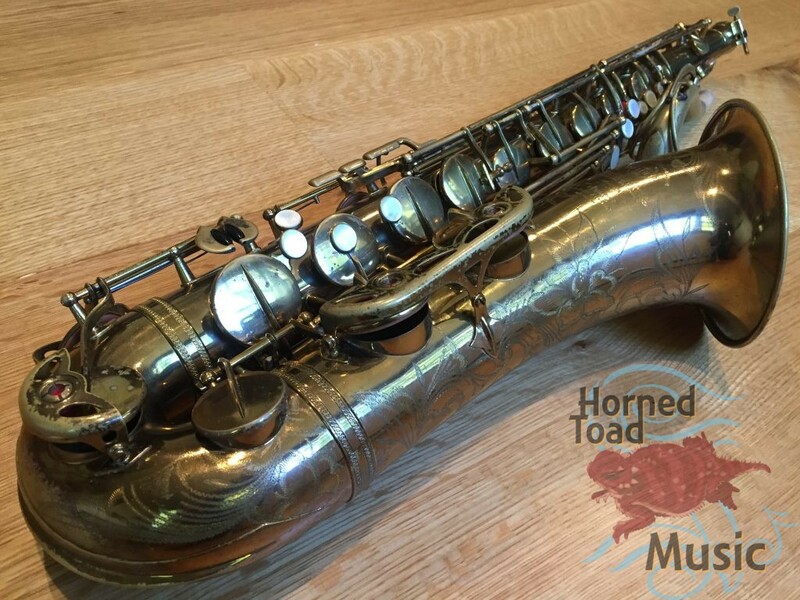 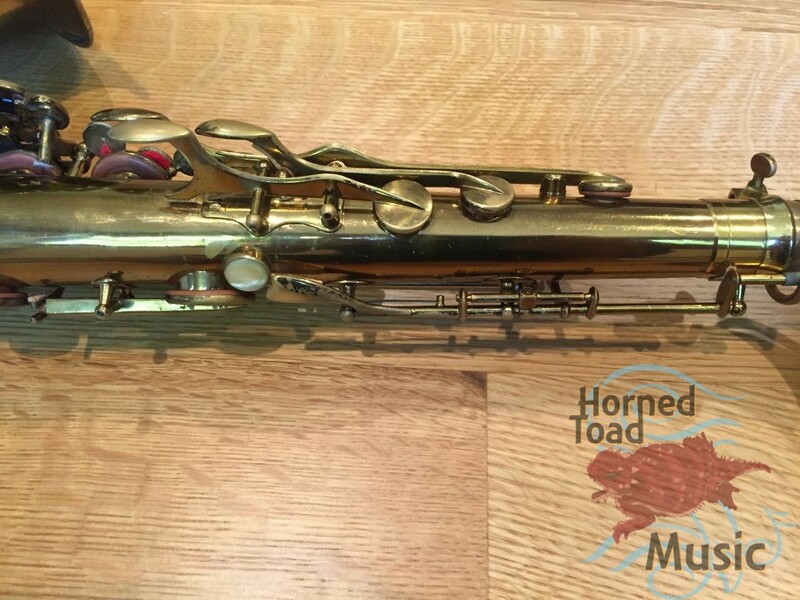 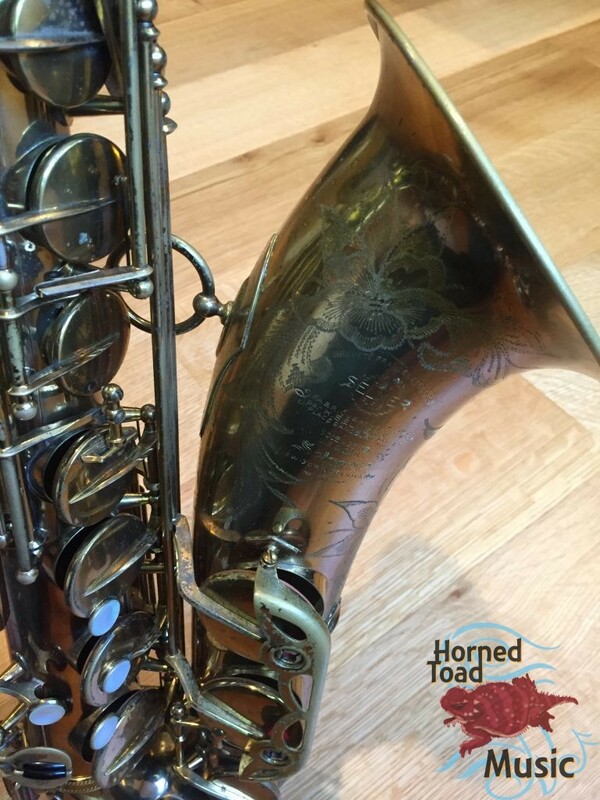 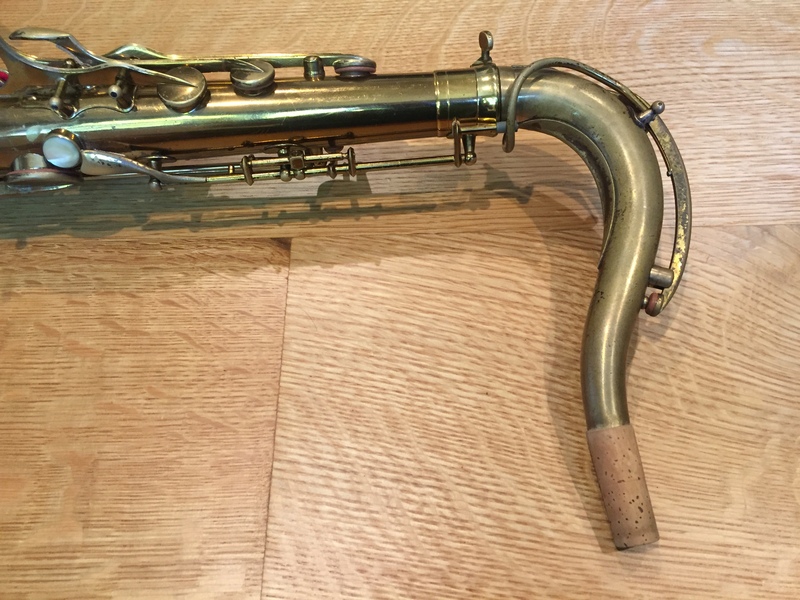 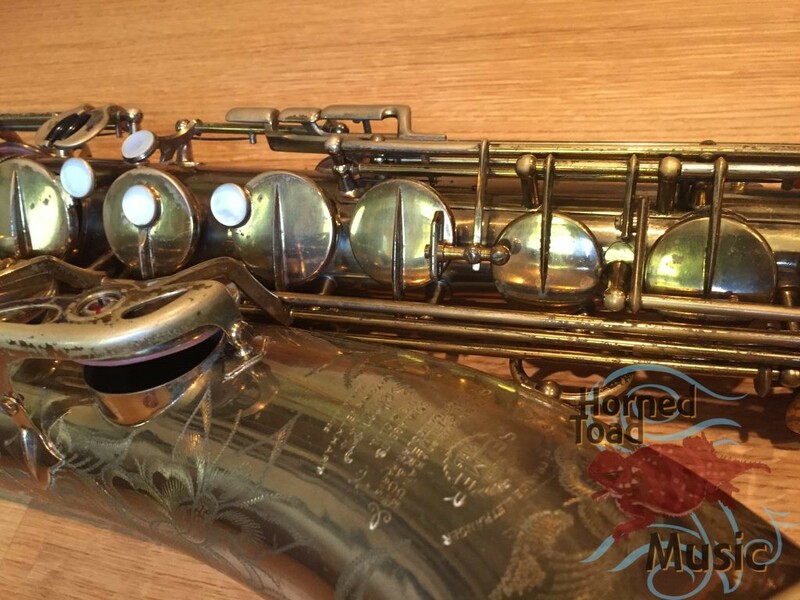 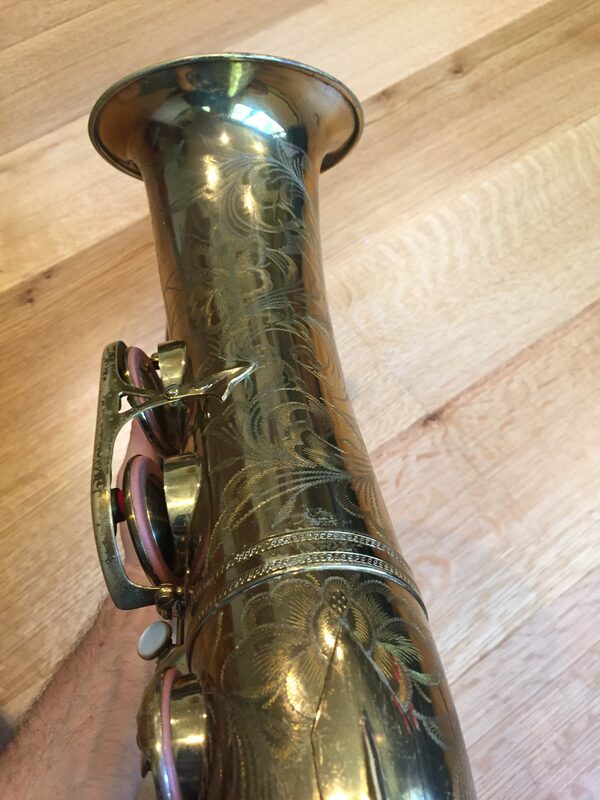 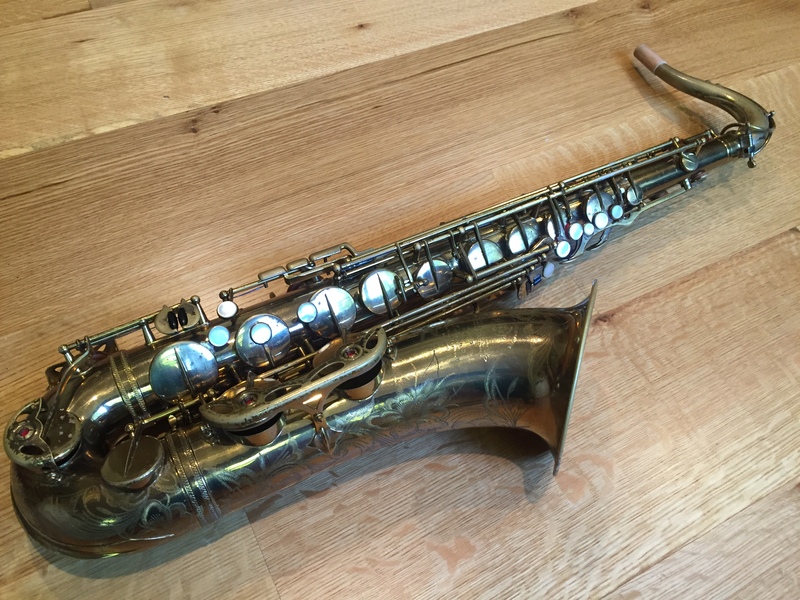 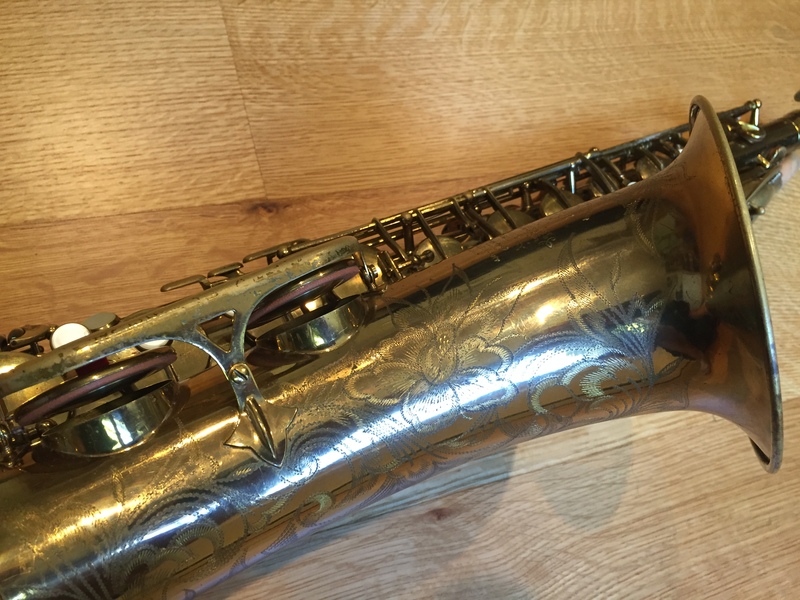 Here we have a Selmer 49xxx SBA Tenor Saxophone with a fresh set of high quality pads and metal resonators and complete restoration. 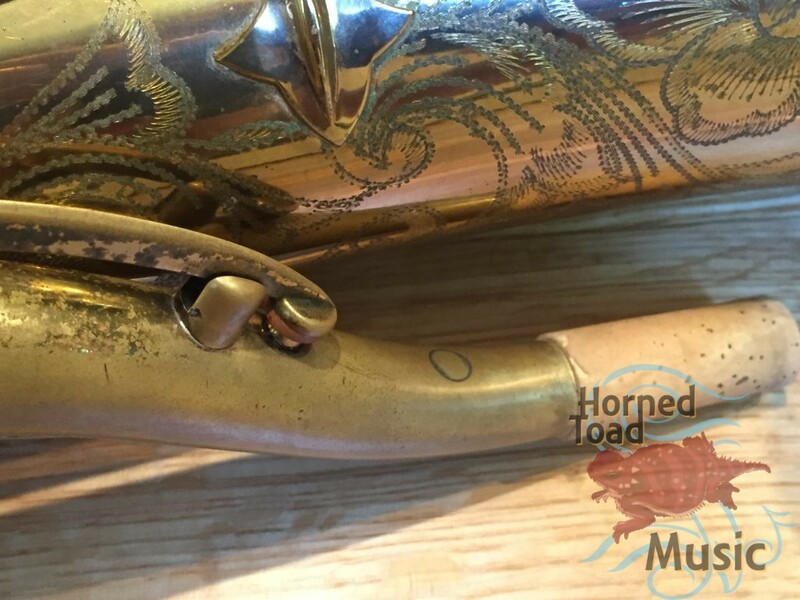 This was owned by a professional musician, clearly. It has a very serious and rare quality of tone and complexity. 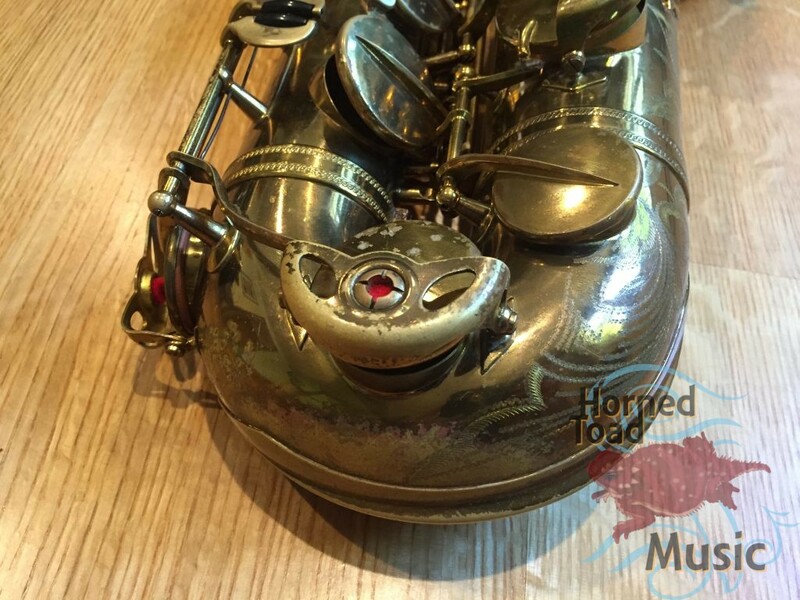 The sound character is sort of dark in the core but edgy and live around the sound. 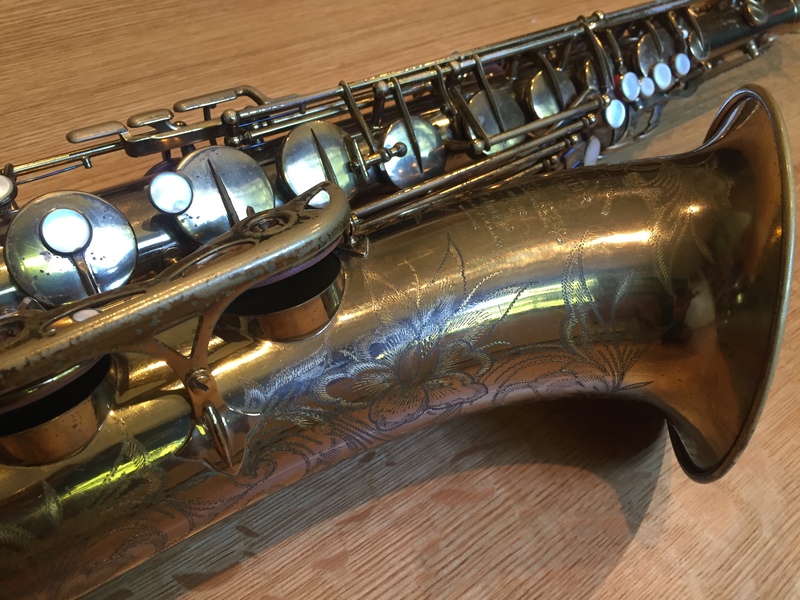 Strangely, it appears to be brighter than my 87K 1960 MK VI, but but also a bit warmer and more lyrical. 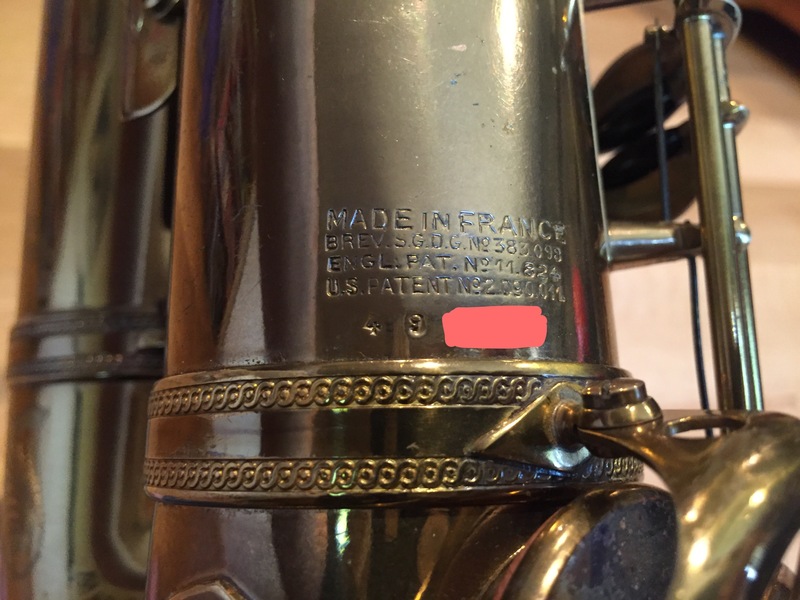 It is a bit more focused than such a MK VI as SBA usually are as well. 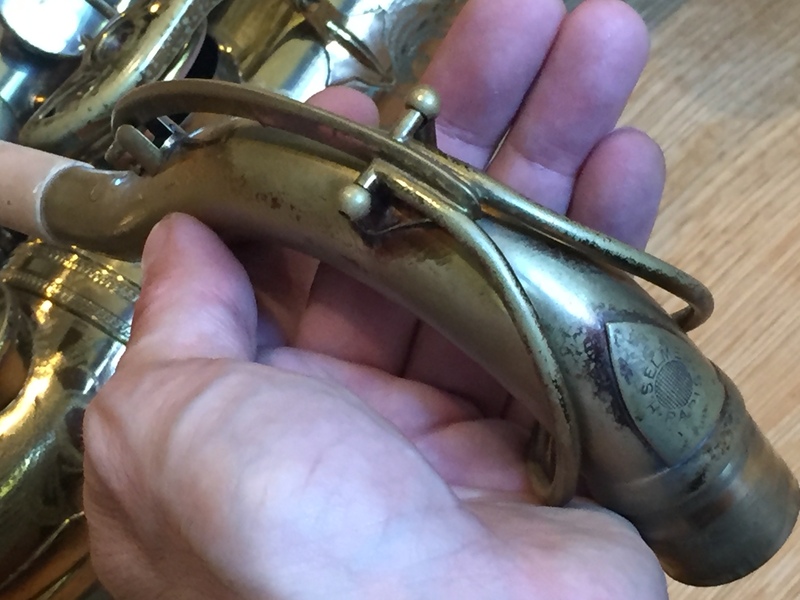 The key action is excellent and perfectly arranged, no need for big hands to feel comfortable. In terms of response it is very fast, and compared to SBA’s in general it is far on the more freeblowing end of that spectrum. 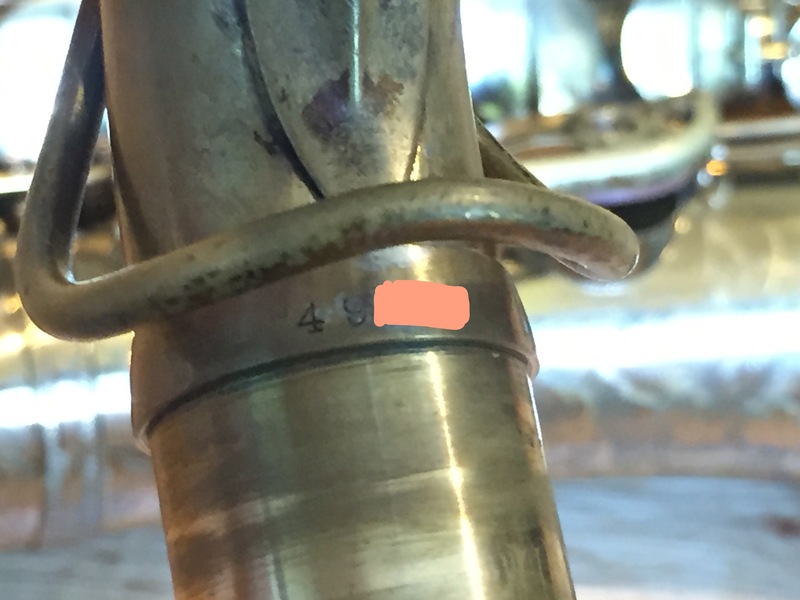 The previous owner wore the area near the thumbhook so I made a metal patch for it that will last for decades. 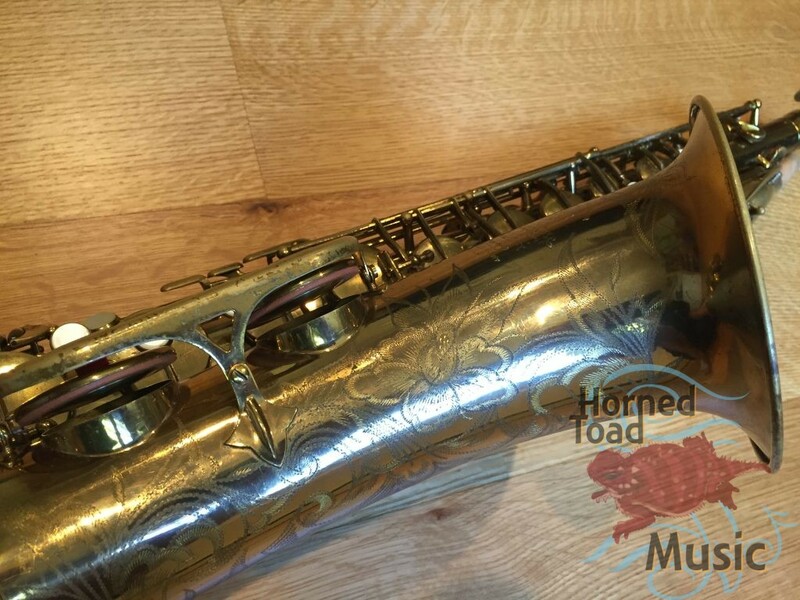 The original matching serial numbered neck had a pickup port installed from probably the 1960’s which I also removed and flush patched as well as generally restoring the neck to original specification after some hard gigging years. Compared to other SBA necks I have here this one is slightly brighter and more live and present, slightly more flexible in tone as well- it’s a great sounding neck. 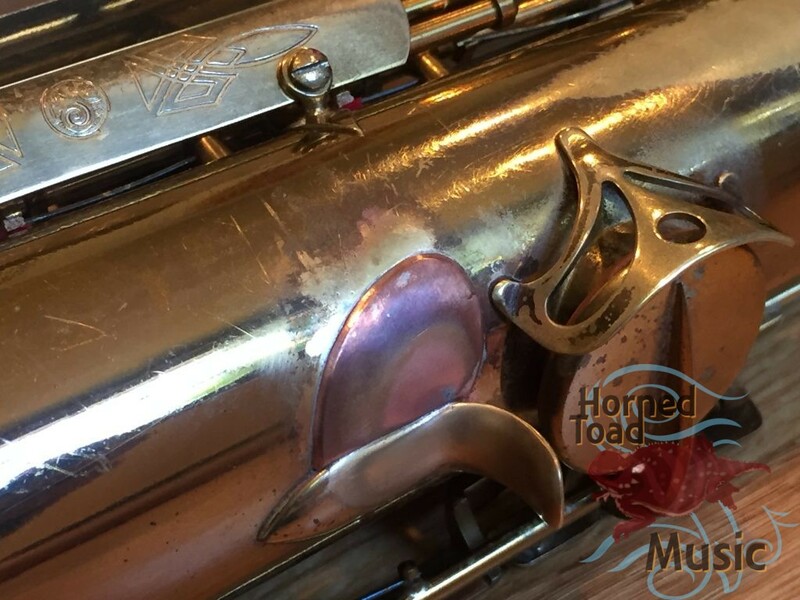 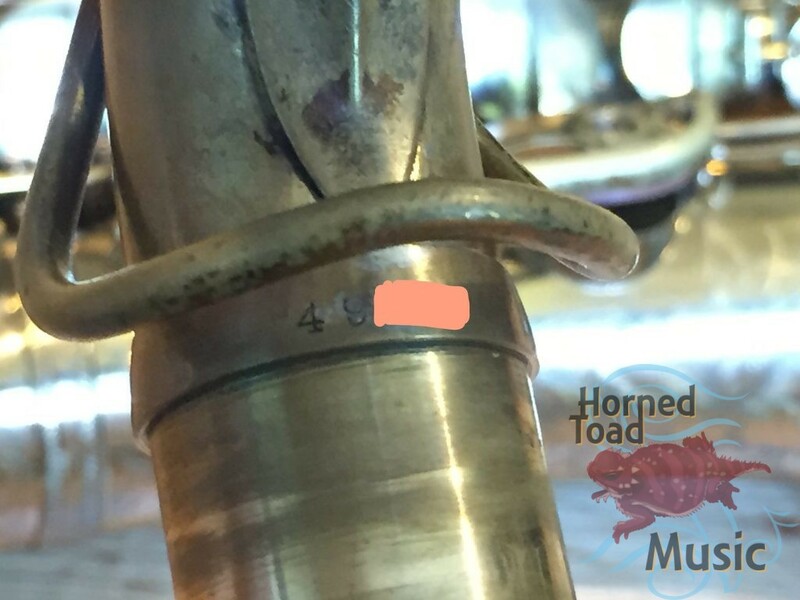 The horn is now quite straight, and most any dents or dings have been addressed. 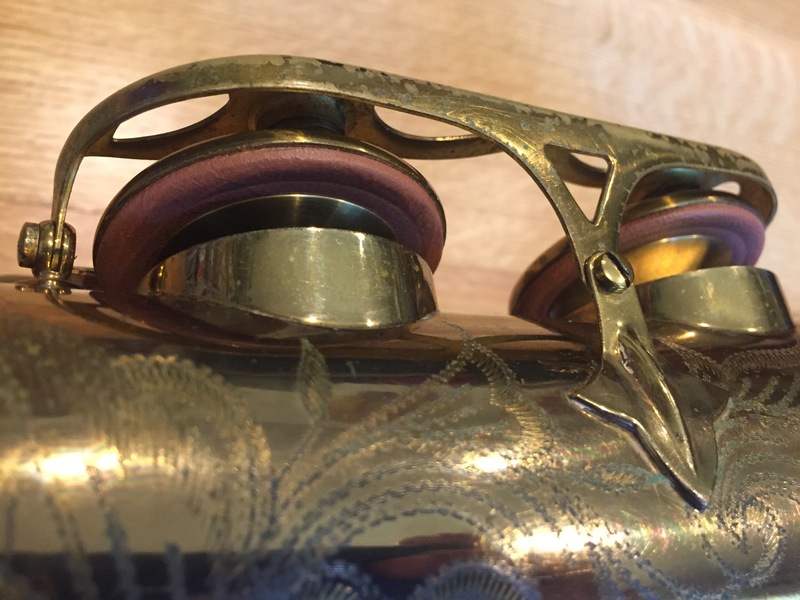 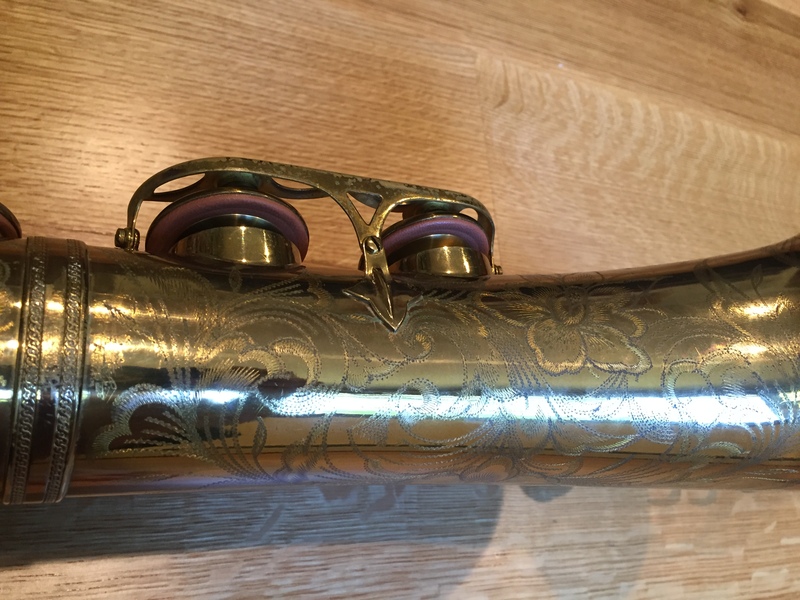 It has a fresh set of very high quality rather hard pads sealed very nicely and including excellent brass domed resonators as the original Tone-X were missing some at the top. 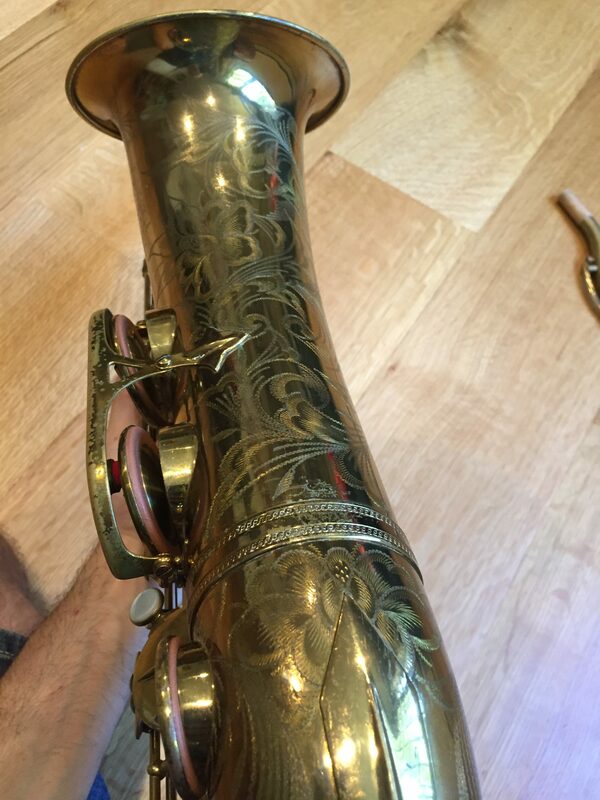 All keys have been fitted, and allowed proper free movement. 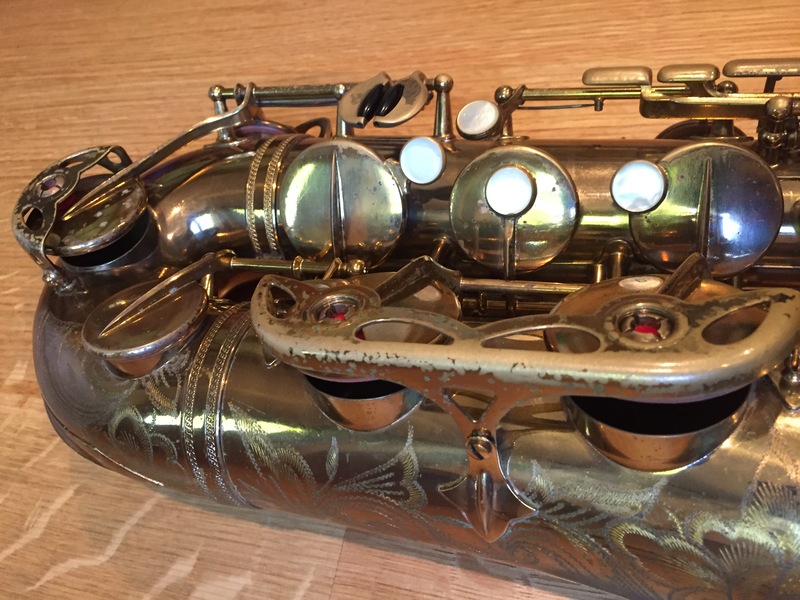 It may need only minor re-adjustement in the future as new overhauls can, but it is ready to gig right now and a thrill to play. 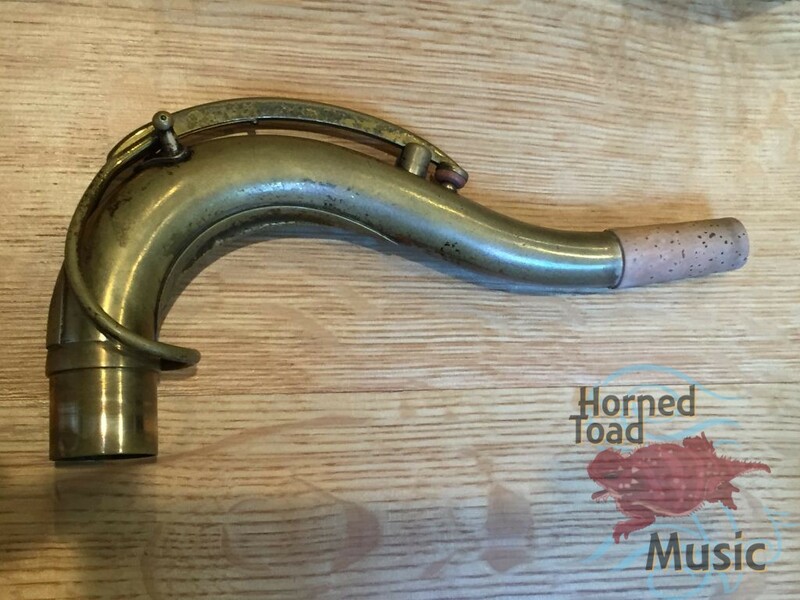 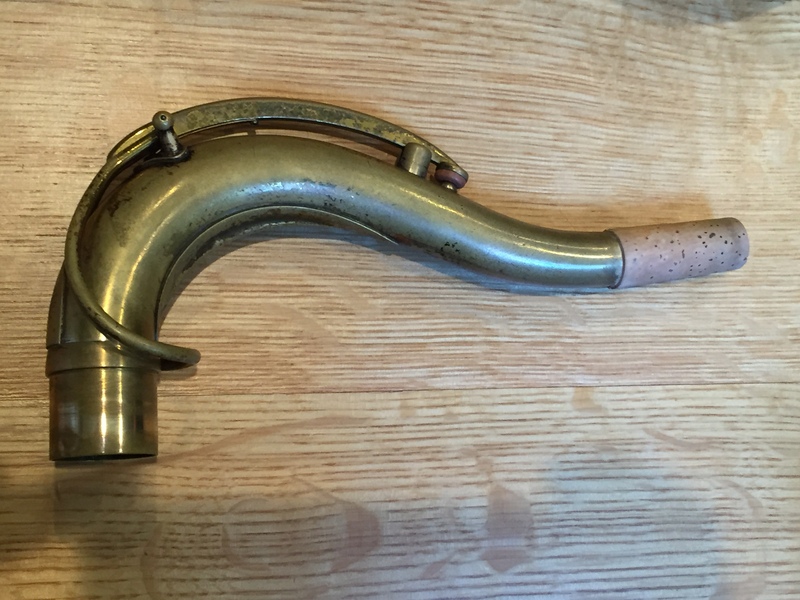 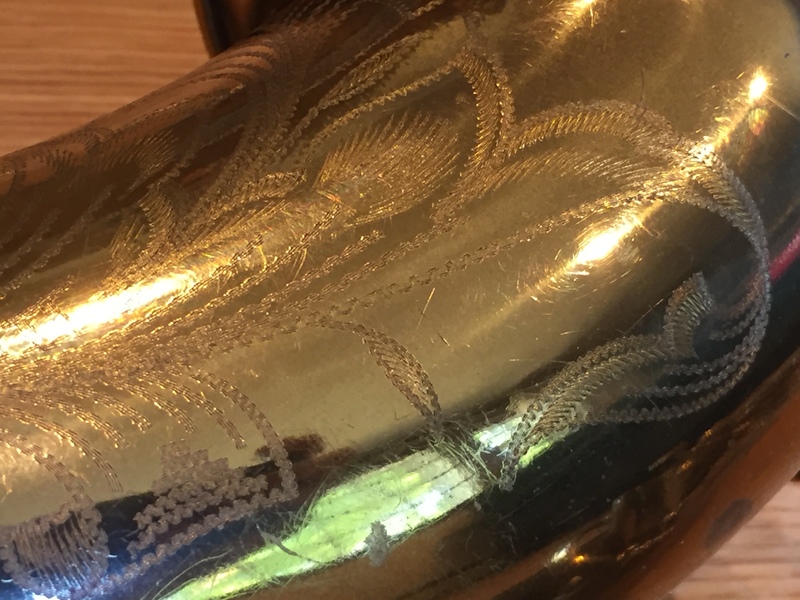 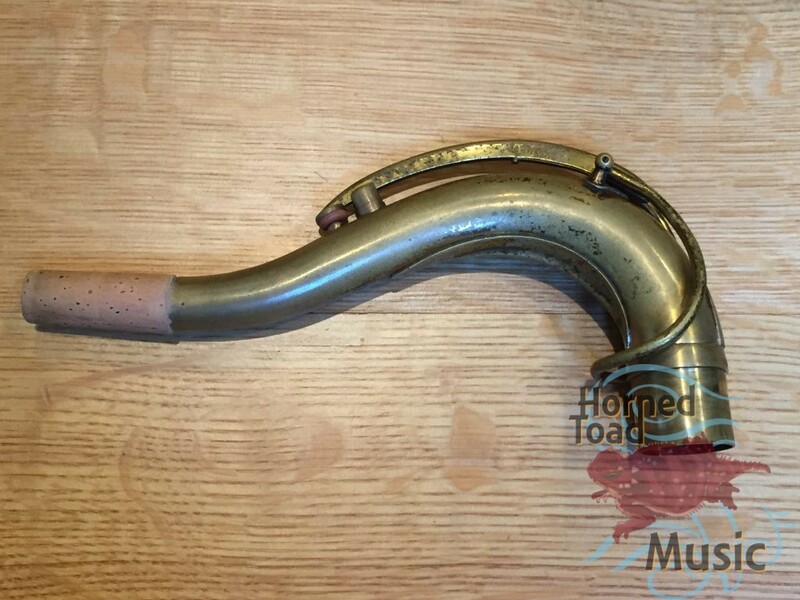 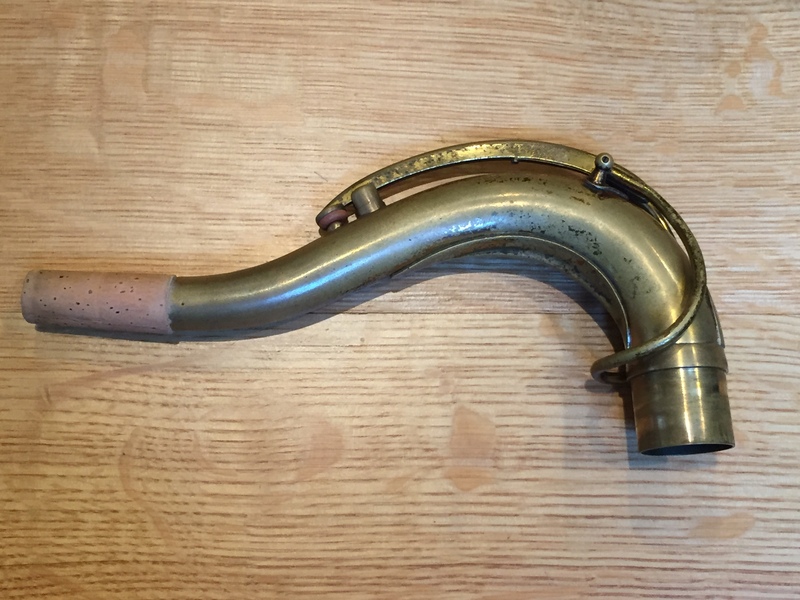 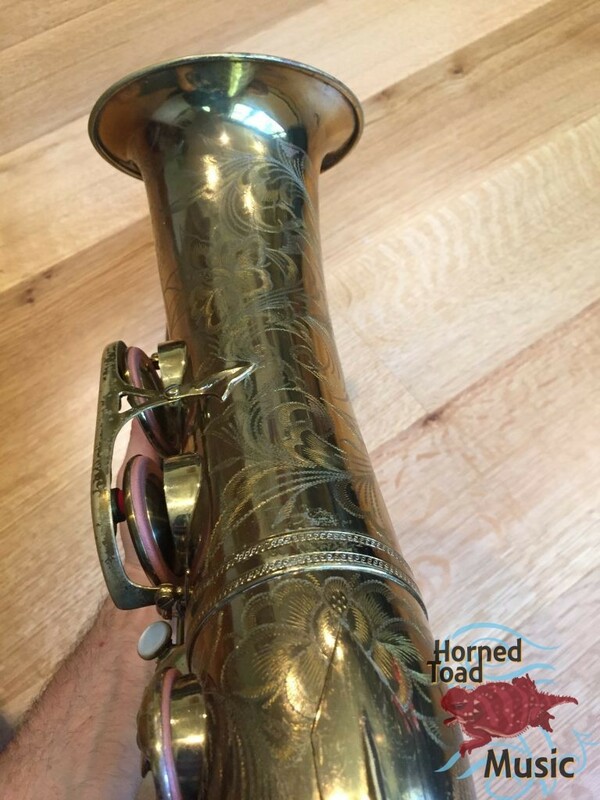 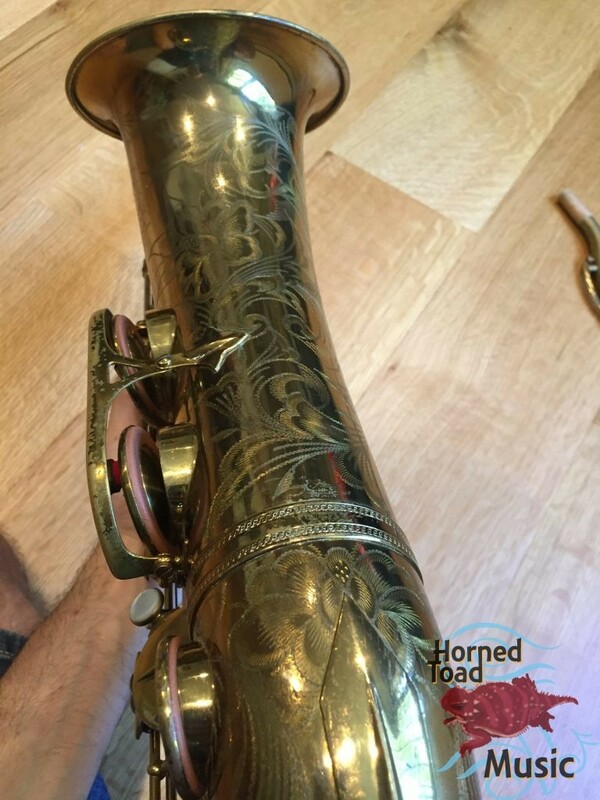 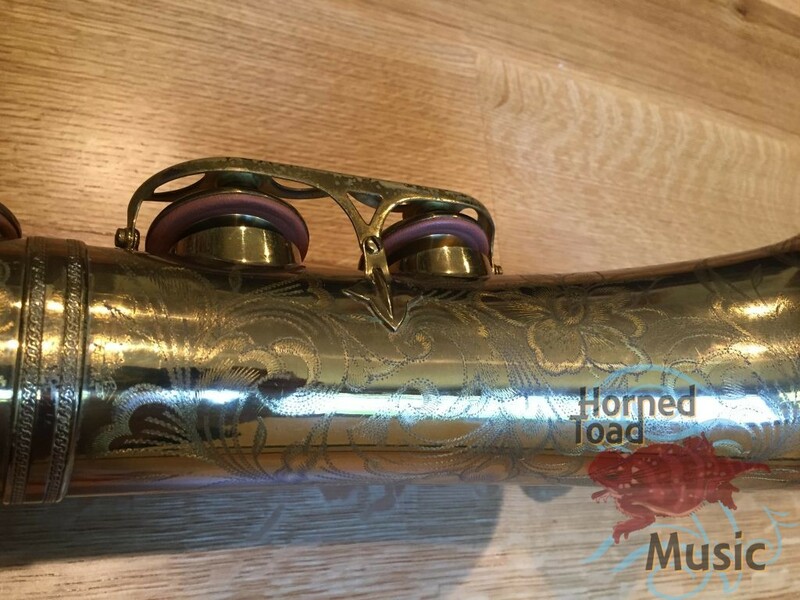 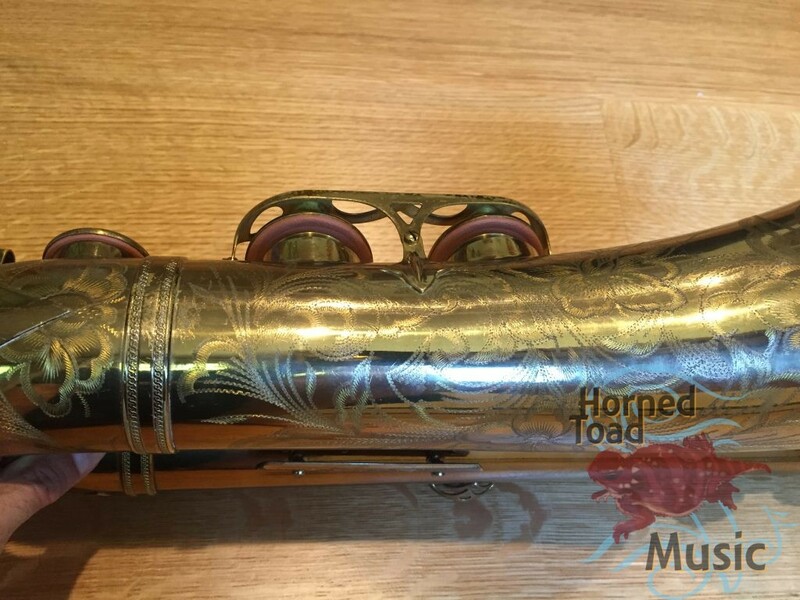 This is a horn not destined for the museum, but for a player, and will make a great right hand for an artist.